Getting your product to stand out from the crowed in a supermarket can be a tough job. One way you will definitely get some heads to turn is by using point of sale POS display. Wandering around Walmart in Zhuhai you can see this display of Kinder chocolate. The placement was well-chosen, it was right at the entrance of the candy section. To make it even more noticeable they placed a second display right at the end of candy section to ensure it will get the attention it is requesting. Since Kinder chocolate is an imported product its therefore sold at a high price. However, looking at the almost empty shelves it clearly shows the effect of a POS display. 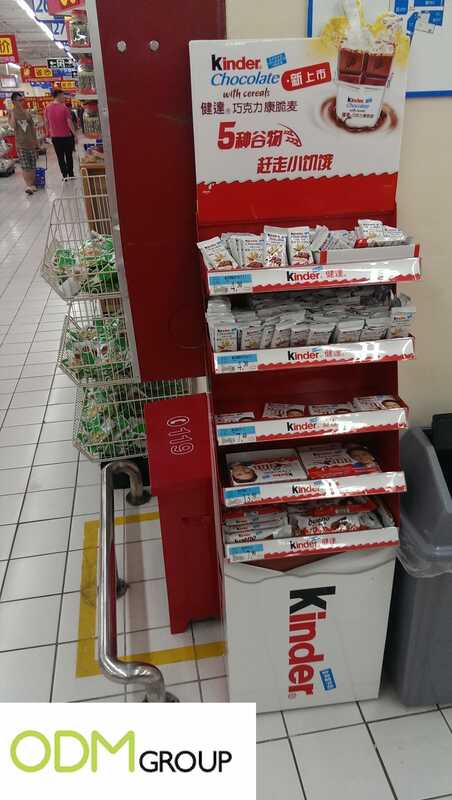 The Kinder chocolate display was made entirely out of carton, the next one by Oreo is made of more high quality materials like metal. Also they used a lit up banner with the Oreo logo on it to attract more consumers. As you can see on the picture below, this POS display is attracting attention because of the lit billboards with advertisements on them as well as the brand name. Furthermore, this display was found in an airport where there are a lot of POS displays, most of them are also made of high quality materials. During this promotional campaign from Oreo for their new travel biscuits, they also developed a limited edition case in the shape of one giant Oreo cookie. Also they hired employees to let consumers try the new biscuit. All these factors combined made this a successful campaign. Another POS display is this one from Red Bull. The well-known energy drink company uses two different type of POS displays to promote their cans individually as well as in a four pack. 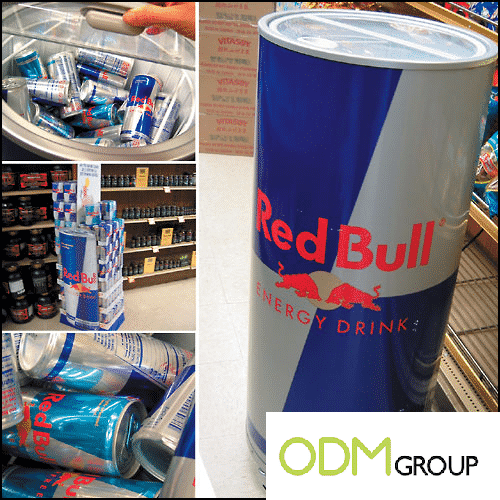 The giant can of Red Bull shown below is meant to promote their individual cans of energy drink, these can be used in small shops, gas or railway stations. The large logo on the side of it makes it a real eye catcher. Moreover, this POS display is at the same time a refrigerator that ensures you to have your drink at the ideal temperature. The second display that Red Bull is using is to promote their four pack of cans, these can be found in the larger supermarkets. By putting it in the aisle it ensures that consumers cannot avoid this POS display and definitely will take notice of it. If you are interested in any POS displays, please don’t hesitate to contact us or our design team at Mindsparkz.